PLUS is a course. PLUS is also a schedule. PLUS is also a collaborative day for teams. PLUS is a lot of things, but it was central to everything we did last year. Ideally, every student in the building had PLUS in their schedule at least twice a week, in addition to PE/PLUS at least twice a week. The PLUS course was taught by myself and co-teacher G. The PE/PLUS course was taught by J and N. The four of us made the PLUS team. In these courses, students received direct and explicit instruction on work habits and non-academic competencies. The work habits we focused on were Collaboration, Communication, Creative Problem Solving and Self-Agency. Not only did we try our best to teach these skills, but we also wanted to provide time to practice and apply them to their own lives. 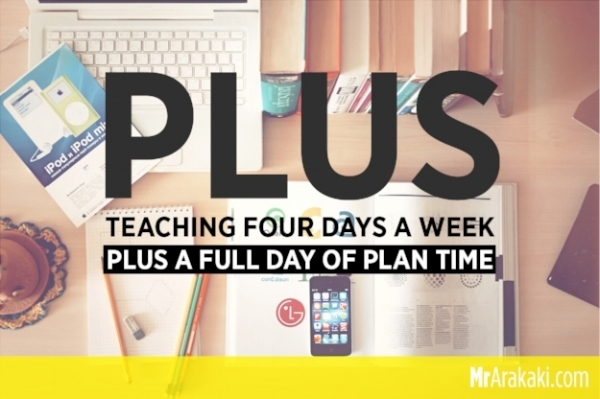 The PLUS schedule was developed so that all students can attend PLUS and PE/PLUS courses twice a week. This was creatively designed through several iterations and input from Time and Talent and a few scheduling specialists. A typical student schedule would have four core courses (English Language Arts, Math, Science and Social Studies), in addition to two encore courses (think electives), a daily Advisory period and a daily intervention period as well. What the PLUS schedule did to students' schedule was that they only attended core courses four days a week. The fifth day would be replaced with either a PLUS course or PE/COURSE. The course that was skipped rotated on a schedule and students picked up this unique rotation faster than the grown ups did. On Mondays, students did not have English Language Arts, they had a PLUS or PE/PLUS course instead. So for a student who had Period 1 English Language Arts, on Mondays they came to my classroom for PLUS. The rest of their Monday was unchanged. Then Tuesday through Friday, they went to English Language Arts during Period 1. Every core was assigned a different day of the week. There was some intentionality put into assigning the days of the week where a core would be replaced. English Language Arts and Math were both given Mondays and Fridays knowing that our district calendar had a lot of Mondays and Fridays off. By having those cores on those days, students did not miss that content. Additionally, the PLUS team was given Wednesdays, knowing that there were very few Wednesdays off throughout the year, since on a PLUS team Wednesday, students will have all four core courses that day. One day a week, core teachers were given a PLUS day to collaborate. Since every Monday students did not go to English Language Arts courses, those teachers were available to meet together. For extended periods of time. Longer than 42 minutes. Regularly. Seven hours to give a rough estimate, with lunch squeezed in there somewhere. The four core teams and PLUS team all had weekly PLUS days to work together. This is where best instructional practices were shared. Innovative ways to incorporate and take advantage of our 1:1 iPad program. Self-reflection and accountability took place. Teachers were honest and identified areas of improvement and teammates provided support. A lot of things happened that usually were put on the back-burner during the short and rushed content meetings of years past. Having the PLUS day for core content teams also shifted the way teachers worked together. In previous years, the focus was on grade level teams to collaborate. This worked well until there were handfuls of teachers who were split grade levels, teaching two sections of eighth grade science and three sections of sixth grade science. These teachers were never allowed the consistency to be part of these teams. Moving toward core content teams aligned better since most teachers in our building taught one subject, where the grade level didn't matter. Science teachers were able to support science teachers. Math teachers were able to coach math teachers. Grade levels did not matter as much anymore as good instructional practices and classroom management strategies. The idea of PLUS days were to support teachers. To give us the time to collaborate. The time to become better at what we do. So it is one year later and I have failed to post anything about PLUS. I'm hoping to look back as one year ago milestones come up in my social media feeds, reminding me of where we were and where we ended back in May. School is starting back up again this month and I'm excited for another year of opportunities and possibilities. If you work at a school with a unique/creative schedule, I'd love to hear from you! Drop a comment.